Throughout the last century New York City’s public libraries have functioned as a hinge point for open access to information and the front door to some of the city’s most critical civic services. Yet as the 21st century continues to become the bottleneck for the entangled challenges of urbanization, climate change, and economic fault lines, this familiar institution has never been more relevant. For some the library is a repository: a place to seek knowledge and information through print and digital media. For many though, the branch library system is a living part of the city’s social infrastructure. Walk through the front door of any one of our city’s 207 neighborhood branches and you’ll likely be greeted by wildly diverse set of program offerings- from job services and technical training, to wellness,cultural exchange, and even disaster resiliency. 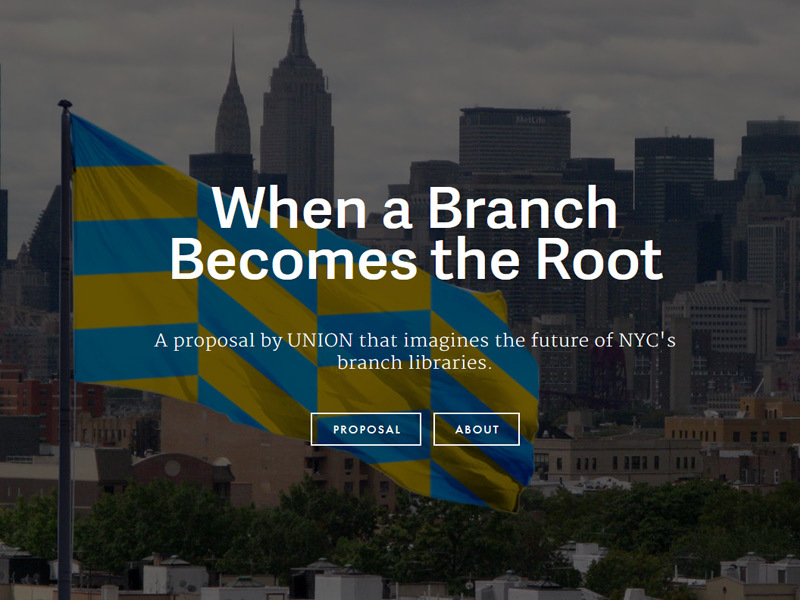 More likely than not, your neighborhood branch is quietly working to ensure social and economic cohesion within the many communities that call New York City home. Small boxes. Big responsibilities. In the summer of 2014 The Center for an Urban Future, in collaboration with the Architectural League NY, launched a study called Re-envisioning Branch Libraries a design study with the ambition to articulate “new architectural, financial, and programmatic possibilities for New York City’s branch libraries.” Five interdisciplinary teams were chosen to develop unique speculations as to what these possibilities might be for New York City’s branch libraries in the 21st century. VisionArc embarked on an intensive collaboration with a bespoke and interdisciplinary team, called UNION, that was convened specifically for this design study. UNION approached the challenge with a diverse set of expertise in architecture, library science, technology, graphic design, writing, and film making. With an interest in narrative and in identifying the essential conditions that link communities to library services- or as we called it: ‘librariness- our team undertook the challenge of making branch libraries more visible as civic institutions within their communities and the city. UNION’s approach was designed as a fictional portfolio of initially small actions that scale up to effect larger political, economic, and social transformations. While we explored specific architectural interventions we introduced systemic catalysts including organizational partnership models, identity systems, and mechanisms that allow communities to access services far beyond their local branch. Together these strategies bring into view normally hidden aspects of library system operations, re-framing urgent state of good repair needs as an opportunity for radical acts that contribute to the social and civic health of the city. On December 4, UNION, along the the 4 other participating teams, presented our vision to New York City elected officials, civic, and cultural leaders at a design showcase and policy symposium hosted at the Japan Society, New York. Videos of the presentations can be viewed here. Annie Barrett, architect and principal of Annie Barrett Studio; Adriel Mesznik, principal of Adriel Mesznik Architecture; Ann Whiteside, Harvard Graduate School of Design librarian and assistant dean for information resources; Bryan Boyer, designer and principal of Dash Marshall; Ceren Bingol, senior architect at OMA; Helen Han, architect and filmmaker; Jane Lea, project architect at Architecture Research Office; Landon Brown, designer, researcher, and director of VisionArc; Ryan Thacker, graphic designer at Might Could; Sapna Advani, urban design and planning director at Grain Collective; and Scott Geiger, writer and critic.